Today’s post brought something I’d been eagerly looking forward to – Le Rocambole for Summer-Autumn 2015. 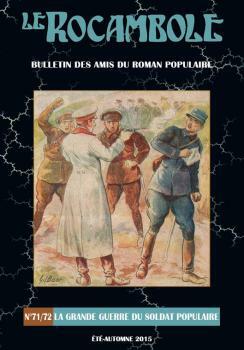 Le Rocambole is the Bulletin of Les Amis du Roman Populaire, whose conference in Amiens I attended last year, and this issue of the journal contains the papers delivered at the conference, including my own: Sapper : du réalisme au mélodrame, (translated into French by Sebastien Le Pipec, and reading much more impressively in his version). The collection provides enough essays on French popular fiction to be a complete crash course in the subject, and there are also some papers on popular literature in Germany, Austria and Britain. I’m glad to see Michael Paris’s Le Subalterne, about the depiction of junior officers in British fiction included here, even though illness prevented him from attending the actual conference last year. Full details of the journal and its contents can be found here. As I read through the contents page, I am reminded of the high quality of the conference papers (surpassed in my memory only by the quality of the conference lunches). Perhaps the papers I shall read most eagerly, though, are those whose authors’ spoken French went too fast for my limited capability. What did they actually say? This entry was written by George Simmers and posted on July 8, 2015 at 2:18 pm and filed under academic, popular culture with tags Amiens, conference, French, Le Rocambole, Sapper. Bookmark the permalink. Follow any comments here with the RSS feed for this post. Post a comment or leave a trackback: Trackback URL.